Within the first fifteen minutes of meeting Chris and Pascal we figured out that we would all be in Thailand for Christmas. We said we should meet up again there so we wouldn’t have to spend Christmas alone. It was a nice idea, but considering I had barely even learned their names, who knew if I’d actually want to see them again for the holidays. Then we spent Whitsundays, Fraser Island and Byron Bay together, and to avoid actually saying goodbye when I left Byron we made real our first impression plan to meet up for Christmas in Thailand. They were coming from Phuket on their way to Koh Phangan and I was coming from Cambodia on my way to Krabi, so we picked a location in between: Khao Lak. We’d never heard of it either… I knew I wanted to try to get to Khao Sok National Park, a can’t-miss recommendation from Josi (whose recommendations have never steered me wrong), and they wanted to do some beach time and snorkeling, and Khao Lak is the launching point for Similan Islands trips, supposedly some of the best underwater scenery in the area. We met in Khao Lak and decided the order of events (partly decided for us by weather conditions): we would spend one night there, then do two days/one night in Khao Sok, then a snorkeling day trip to the Similan Islands, and still have a final day to chill in Khao Lak before going our separate ways. This meant we were in Khao Sok for Christmas Eve night and Christmas morning. We were all united in our lack of care for how we spent Christmas. When you’re traveling holidays are just another day. I completely took this perspective to heart with Christmas. Why does a calendar have to tell me when I need to see family? Just because I was out of the country on December 25th doesn’t mean I miss them any more or less. I got to spend three weeks at home with my parents before I left and saw more family at a great going away party. To me that was more important time spent with family than a day someone centuries ago declared should be the family day of all family days. Still though, there was something special about being in such a scenic place on the pinnacle of Christmas for both of us – the Germans celebrate on the evening of the 24th and the Americans on the morning of the 25th. We toasted to Christmas with our cheap red wine. And our next bottle of red wine. And all those beers. We toasted and played cards until they shut the power off on us and forced us to go to sleep, before 11 pm. Khao Sok is gorgeous. We met up with the other 6 people doing the two day one night tour at an office near the park and were driven out to the dock, where we all crammed into a long tail boat and set out into the wide open lake. Karst rock formations rose out of the water all around us, more densely than I’d seen in Halong Bay but no less majestic. The water was a deep turquoise blue, a color I didn’t know a lake could be. Long tail boats sit low in the water and we were a lot of people in our little boat, so we got a little wet. This is why, about 20 minutes into the ride, our guide flagged down a passing bigger long tail boat and informed us we would be switching boats. There was no pier in site. We pulled into a little inlet where the water was calmer shielded by the mountain and jumped from the front of our boat into the new boat that was pulled up alongside us, and its former passengers did the reverse. Somehow this worked out and we were back on our way. I got to lay up front and watch the mountains pass by in the sky above. Not much longer and we saw where we would be spending the night: our floating bungalows. The image in my mind of floating bungalows did not do them justice. In the middle of this expansive landscape of mountains and water, a small row of half a dozen traditional bamboo huts were latched together in a row, hovering on floating barrels. They were loosely attached to a permanently wet plank walkway in front (which I was terrified of falling off of in the dark after the wine) that connected to the most intact structure, the bathrooms, which linked to a few more substantial houses, lashed to the dining area, which was then attached to the staff area. When we arrived the dining to staff areas were in an L shape, when we woke up the next morning they were in a straight line. They’d made some adjustments. When we got there we had lunch and free time before an afternoon hike. It didn’t take long to get our bathing suits on and jump into the water right in front of our bungalow (all three of us shared one bamboo bungalow – guess who got to sleep in the middle with neither of the two blankets). We took the kayaks out for a joy ride around a smallish island, the calm water making it easy to glide around. The jungle hike was more than expected; it was wet in Khao Lak so a lot of the path was just mud. We practiced our balance, jumping from root to root, playing hot lava with the mud; or at least most of us did, Chris gave up pretty easy and just trudged through the mud and water. We saw spiders and crabs and lots of rainforest trees. I even picked up a leech, which the guide quickly tore off of me. It had bitten me through my sock, which was now soaked in blood. I learned that leech bites don’t stop bleeding for a long long time. First a wasp in the Amazon, now a leech in the Thai jungle, it’s like my insect initiation into jungle life. After the hike we did a quick walk through an old cave and saw bats, more spiders, and played the stalagmites like chimes. The next morning we were out on the boat before breakfast to spot some local wildlife – birds and monkeys – and had more swimming time when we got back before our after-lunch departure home. It was a peaceful two days with lots of down time, swimming time, hanging out time, learning new card games time, and generally disconnecting from reality time. Which I think was a great way to avoid the social media influx of Christmas reminders. I couldn’t be happier with how I spent the holiday and who I was with. The ride back out was just as picturesque as it was on the way in. 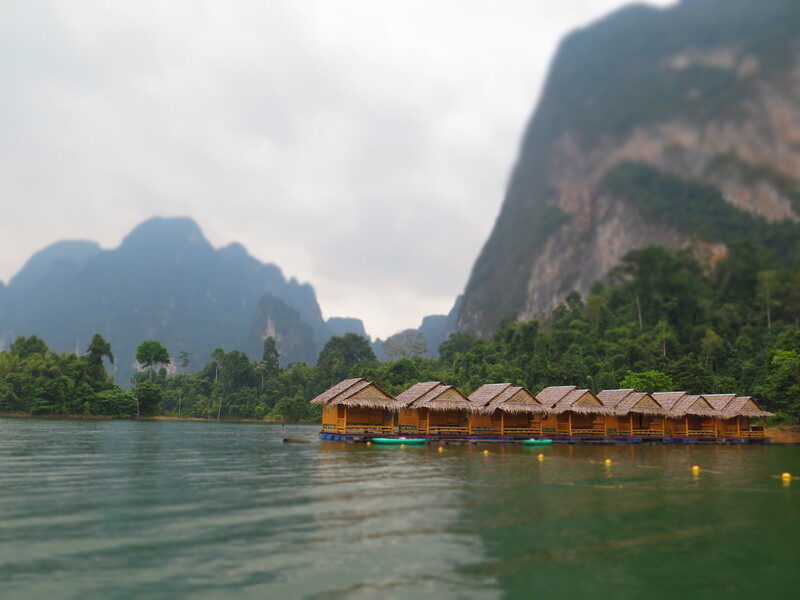 The rain flirted with us, it had been on and off all morning but mostly held off for our ride back out, but even in overcast weather Khao Sok was a magical place. As happy as we all were with our time there, more than two days probably would’ve been too much. There’s only so much nothing you can do sometimes, and we had fish to swim with in the Andaman Ocean.